The real taste of India. Microwavable in just 1 1/2 minutes. Chilli rating - medium - 1. Gluten free. No artificial colours, flavourings or preservatives. 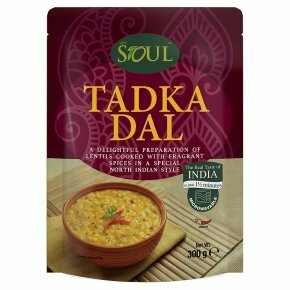 Suitable for vegetarians and vegans.Soul aims to bring the authentic flavours of India to the comfort of your home. Our master chefs select only the finest ingredients to create authentic dishes, ready-to-eat in minutes. Simply microwave for 1 1/2 minutes to resolve those hunger pangs! Soul products do not contain any artificial flavourings, colours or preservatives, allowing you to enjoy a lip smacking experience with every morsel! Make a small cut at the top of the pouch. Place upright in microwave and heat on high for 1 1/2 minutes. Remove pouch from microwave and allow to stand for 1 minute before serving.Alternatively, you can empty pouch contents into a microwavable bowl. Heat on high for 1 1/2 minutes.